The day after Lilla’s chance meeting with the Russian Butcher, we ventured downtown San Francisco to do a little Christmas shopping. After a few hours of browsing, we decided it was time L made acquaintances with Santa. To our surprise, there was only a 5-minute line. We took that as a sign and ventured onward. Lilla was in the best mood. Pointing at all of the Christmas trees and ornaments, spouting “Utz dat? Utz dat?” And then we were on deck. The 10-month old kid in front of us was gingerly placed in Santa’s lap when he full-on lost it. Wailing at the top of his lungs. This piqued Lilla’s interest. She glanced at him and Santa. I told her it was okay. And she seemed to buy it. She smiled, and waved “hi” in her high-pitched voice. At that moment I thought to myself, ‘sweet, this is going to be a breeze. 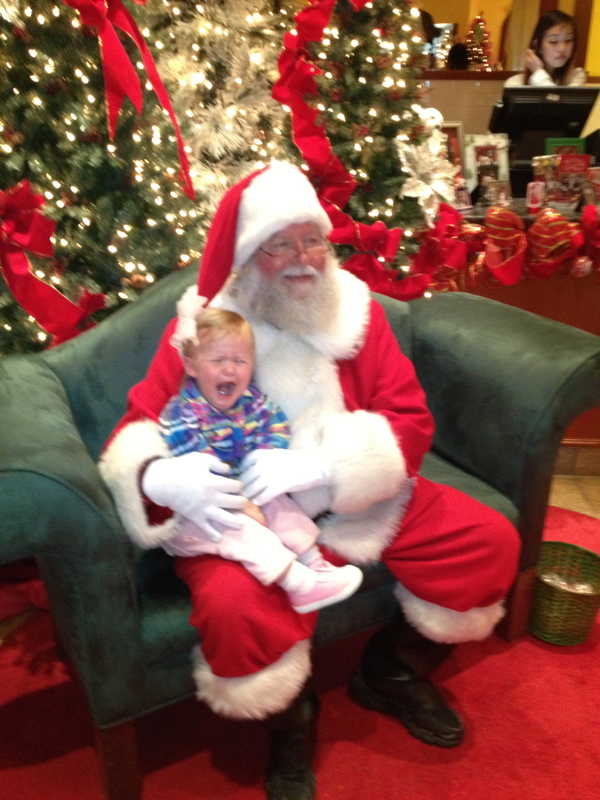 She’s going to be one of those kids that LOVES Santa. We’re gonna have the best and cutest Santa pics ever.’ And then we were up. I walked slowly with L in my arms toward Santa. Her go-with-the-flowness suddenly took a turn for the worst. 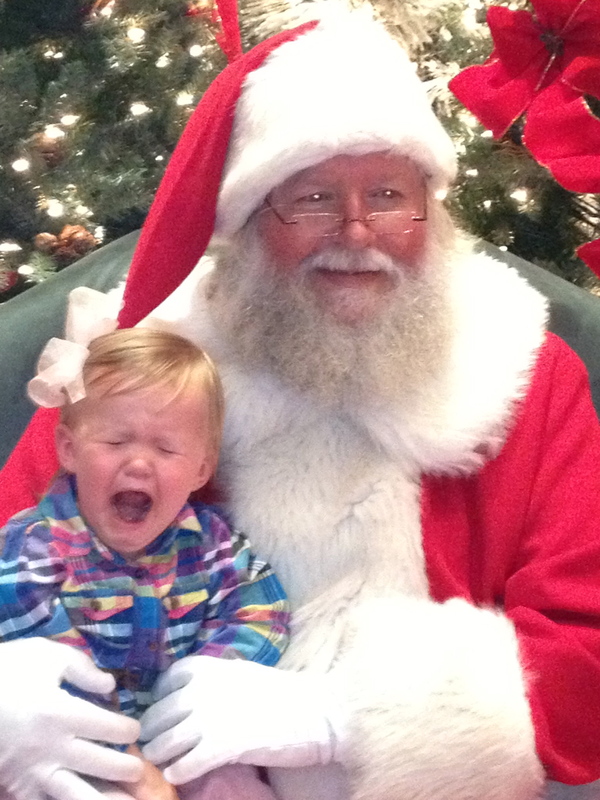 She started putting two and two together as I set her down on Santa’s lap. Her eyes widened as her little toddler fingers clung to me with a vulcan-like grip. And then I backed away. What followed was silence (because she couldn’t catch her breath). Quickly followed by shrieking. And then screaming. And like the caring parents we are, Jon and I watched and laughed. Yep, that’s right, we laughed. Because it was effing hilarious.